Hard drive is assigned a new disk serial number when you format whole drive or specific partition. Number of software programs installed on computer use this serial number as reference to function. “Hard Disk Serial Number Changer” is a free utility that allows you to change hard disk serial number without need to format the hard drive or its partition. The standard serial number format is XXXX-XXXX, using HEX symbols 0-9, A, B, C, D, E, F. the total length should be nine and using upper case characters. Using this utility change the serial number and reboot / restart the computer to apply new disk serial number. 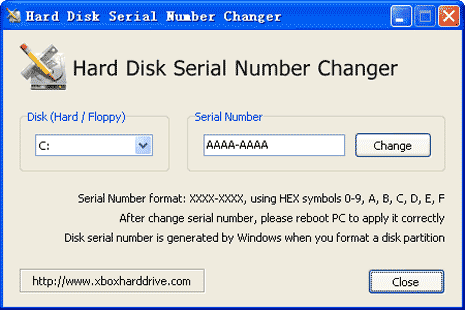 Download Hard Disk Serial Number Changer, it works with file systems: NTFS, FAT, and FAT32 with supported operating system: Windows 7, Vista, XP, Me, 2000. Note – This serial number of hard disk is not hardware serial number set by the manufacturer, the hardware serial number value won’t change even if you format your hard drive. This works fine with windows 7. Just need to run it as an administrator. Running as a regular user or user with admin-level privleges will not work. I’m on win 7 and get a “unable to write to disk device” message. Does not work ast stated. run it as admin and windows vista sp3 compatibility mode. Anyway to change the physical serial number? Because this will fail on applications using physical serial number, like hddphysic from rlbyte.